As you read about making bento, you might wonder how this is all possible to do in the busy morning. It is possible, since millions of Japanese people do it every day - and no, not all of them are stay-at-home mothers (and who is busier and more time-constrained more than a mom anyway?) Practice makes perfect, so the more you make bento the faster you get. But a little bit of preparation and forethought goes a long way towards streamlining your bento making. Mise en place is a French term that means “setting in place”. In professional kitchens, mise en place is essential to fast and efficient food preparation. In a home kitchen, you might not need to bother with this that much, but for bento making it’s quite useful. I don’t go as far as to lay out all of my tools in the kitchen before going to bed since I’m not that organized, but I do have everything that I will need stored where I can easily get them out. The pots and pans I use all the time, especially the small frying pans, are where I can pull them out right away, the bento boxes and other accoutrements are in one section of my kitchen cupboards, and the electric water kettle is always on the countertop. Nothing slows you down more than having to get to your pans where they are stacked under a pile of other things, or having to search for your bento box behind a lot of other junk. Another thing I do is to stay away from any equipment that is a bother to clean - things like graters (except for a Microplane - see essential equipment page), whisks and so on. I mostly use a pair of long chopsticks called saibashi for mixing tasks. You don’t have to do a lot of elaborate pre-planning, but just knowing what you intend to make will stop you from wasting time. I pre-plan in two stages; first when I am doing the grocery shopping, and second on the night before, when I put together a short list of what I intend to put in the bento boxes, written out on a Post-It note and stuck to the edge of the range hood. This is rather similar to the order slips that come into a restaurant. [Edit: Now I use this handy weekly bento planner sheet which makes things a lot easier!] List in hand, you can start cooking right away. I don’t have a dishwasher (I also need a new kitchen!) and I hate to come home to a sinkful of dirty pots and bowls. 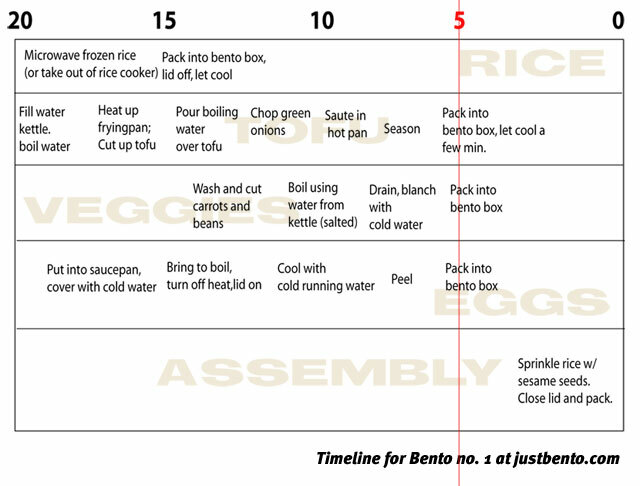 So, I wash everything up before I’m done with the bentos - usually in the last 5 minutes while the bentos are cooling down (see a bento making timeline). It’s not as much of a pain as it might sound, because I mostly use non-stick pans or coated enamel pans, I don’t use that many pans, and I only use a little oil in anything I make. (Oily mess is the most bothersome to wash up.) I use only a smidgen of dishwashing liquid, and just rinse most things with the hottest water that will come out of the tap. The one pan that can be a bit sticky to clean up is the grill pan (which I use maybe once a week at most), but I’ve found that pouring in some of the hot water from the trusty electric water kettle while the pan is hot will loosen anything stuck to the grill, which can then be just brushed and rinsed off. Don’t forget to at least rinse off the empty bento box when you get home! Tue, 2007-11-06 19:13 by anon. How excellent! I’m always interested in the seemingly mundane specifics of the cooking process, especially in this unique context! I’m an American without much proximity to other cultures so the art of bento-making is quite new to me, but I love your site. One question I have: do you only plan for the box to be good to sit from morning until lunch, or have you prepared boxes that are designed to last longer, such as an entire day? Most of the obento I make are designed to be eaten for lunch that day, but I do sometimes make ones that are intended to be eaten that evening or even the next day. I’ll post some of these in the future! how much shld i sell our(its grp work) bento meal? do you have any nice a little spicy bento recipes for me? I love this new site of yours! i absolutely love bentos but i have no time to prepare them in the mornings ._. i got a question anyway. Do you ever prepare food the night after or you only use the lefts from dinner and actually re-cook them the morning after? i’m asking this because i usualy have no time at all in the mornings so i thought it’d be nice to prepare bentos the night before. i know rice shouldn’t be prepared the night before so i’m using your freezing-rice technique (which works great). Sure, I often prepare things - or almost everything - the night before, though I don’t really pack the bentos the night before. I guess you could though (and keep it in the fridge); however keep in mind that refrigerated rice is not that nice if it’s exposed to the dry air in there at all, so it’s best to wrap it airtight with plastic or something. Or, do what I do quite a bit and put the warm rice in the bento box in the morning, but have your other ingredients ready to go. HI, I just saw this for the first time and I have a couple of questions. One. Bento on a budget. . . I am on a (currently) very restrictive monetary allotment. ( I made more ‘take home’ as a student.) I have been wanting an economical way to have my lunches at work where is is NOT JUST ‘ramen’ noodles. I would like to incorporate riceballs and meat into my daily fare, economically. Do you have any price busting recipes? Any kind of leftovers can work in a bento lunch. For instance you could get a jar-type insulated bento (e.g. Mr. Bento) and pack a soup or a stew in there, with some bread or something. Also, if you make something that is soupy, you can take out some of the vegetables in meat in it with a bit of the sauce, cook it down a bit to reduce the liquid, and use that with rice - or mix in with rice. The key to making leftovers look attractive is to pack them with some fresh ingredients - e.g. cherry tomatoes, or broccoli florets, etc - to brighten the whole thing up. I’ll point out such tricks with the bentos! Using long chopsticks is a great technique for mixing... I am not currently in the habit of using them but I recently got inspired to give them a try. I was watching a Julia Child show on omelets at the recently reopened Smithsonian American History Museum, and she used chopsticks for mixing the eggs. It caught my attention b/c this was back in probably the 70s that the demo was filmed, before as much Japanese/bento influences were getting into American kitchens. Thanks for the reminder of using them!